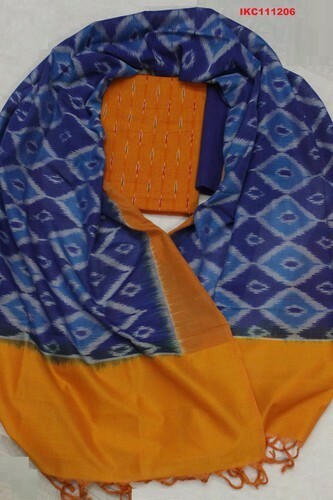 The Ikat handlooms Salwar Suits, manufactured and woven by using Tie and dye Technique process with ikkat artists who has rich experience in designing and weaving. Eco-friendly colours have been applied. Washing separately for first time, since the same has been dyed and the excess residual colour will bleed during the first wash.
Kala Bharathi Handlooms was come into being in the year 2010. We are a Sole Proprietorship based firm and located our office at Hyderabad. We are Manufacturer, Supplier of a wide collection of Handloom Items/Products such as Handloom Fabrics, Cotton Fabrics, Handloom Dress Material, Silk Sarees, furnishing, home appliances and others. And in order to meet and cater the application needs of our various domestic, industrial and clients across the world. We offer quality products such as Export Oriented Ikat Handloom Fabric, Exportable Fabrics In Tie & Die, Handloom Sarees and more. All these products are crafted with the use of 100 % cotton yarn, azo free dyes etc, to ensure their high-quality in all aspects of eco-friendly in nature, apart from our team of artisans and craftsmen makes sure that, it will meet the fineness of the range by using core traditional as well as modern scientific methodologies in the production procedures. It's our team's thorough efforts that go towards quality production of products, we are able to offer the clients all the best range of products, moreover, we have our own weaving units/products units, which are well equipped with the perfect weaving and as per the market demand, to keep change/modernize our weaving/production designs. We continuously strive towards meeting the new demands and meeting the customer expectations as per the market demand.